We are pleased to welcome Sir Paul Nurse (2001 Nobel Laureate in Physiology or Medicine) to give a lecture as follows. 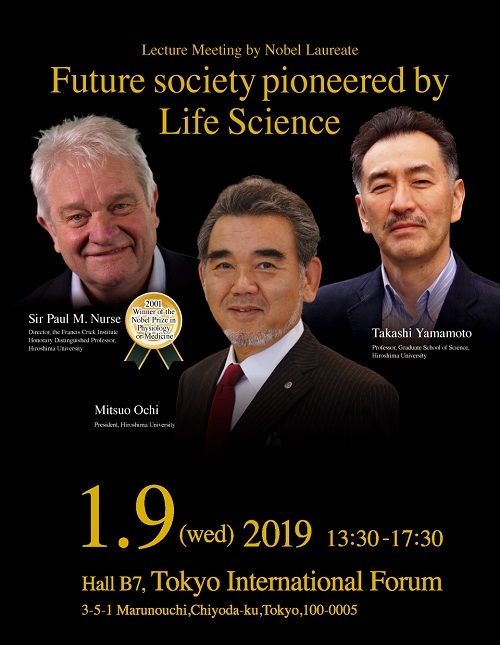 This lecture meeting will also include talks by five leading-edge researchers of Hiroshima University who play a globally-active role in the fields of life sciences and medicine. Admission is free, and simultaneous interpretation from Japanese to English is available. The lecture is open to anyone who is interested. The lecture will be broadcast live on YouTube from 13:30 on January 9 (JST). Please register from here (It will automatically direct you to the Forum Website) or contact us with your name and E-mail address. Please let us know whether you would like to use simultaneous interpretation equipment.